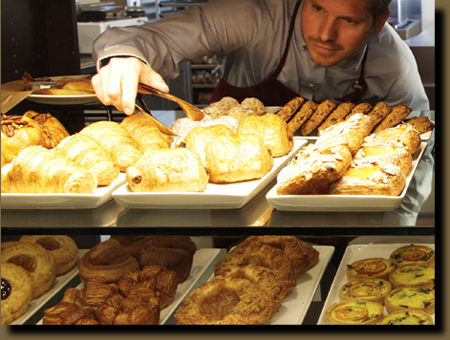 Wild Rye Café Bakery™ is Seattle's newest place for breakfast, lunch and wonderful baked goods. Offering an impressive array of fresh pastries, breads and other house-made treats, as well as daily made-to-order sandwiches, hearty soups and tossed-to-order salads. Wild Rye was created in the style of the classic delis and bakeries of the '30s and '40s, where everything was made in-house. Wild Rye roasts its own meats, uses Shephard's Grain flour, stirs up soups from scratch and offers a selection of house-made breads each day. In these days of fast and processed food, Wild Rye offers a truly wholesome - and delicious - change of pace. Wild Rye is open from 7:00 a.m. to 3:00 p.m., Monday through Friday (except holidays). It is located in downtown Seattle, adjacent to The Conference Center at 806 Pike Street (on the Northeast corner of 8th and Pike, between 8th and 9th Avenues). Breakfast - Steel-cut Oatmeal, Asparagus and Mushroom Quiche, Our Chef’s Speciality, Scrambled Egg Burrito with Jack Cheese and Salsa, House-Made Granola with Berries and Milk, Seasonal Berry & Fruit Parfait. Bakeries - All baked goods are created daily in our pastry kitchen, Selection of Muffins, Assorted Pastries, Sticky Buns, GIANT Cinnamon Roll, Sweet Treats, All treats are lovingly made each day in our pastry kitchen, Almond and Coconut Macaroon, Two Times the Chocolate Brownie, Biscotti, Apricot Rugelach. Hot Beverages - Our coffee is fair trade and organic - Espresso, Latte, Mocha, Cappuccino, Chai Latte, Justa Cuppa, Numi Tea. Sandwiches - On your choice of house-made bread: Brioche, Honey Wheat, or Marbled rye; Reuben (Pastrami, Swiss, Sauerkraut, and 1000 Island Dressing), Smoked Turkey (Swiss, Tomato and Lettuce), Black Forest Ham (Swiss, Tomato and Lettuce), Roast Beef (Cheddar, Tomato, Lettuce and Horseradish Dressing), Chicken Salad (Lettuce and Tomato), Vegetarian (Avocado, Roasted Portobello, Tomato, Lettuce and Cream Cheese Spread), Grilled Chicken (Lettuce, Tomato and Pesto), Cup of Soup and Half Sandwich. Add a fountain drink and chips to your meal. Assorted Chips. Soups - Includes your choice of a house-made Honey Wheat Roll or Brioche: Cup, Bowl - Chicken Noodle, Clam Chowder, Roasted Potato and Corn, Soup of the Day. Salads - Includes your choice of house-made Honey Wheat Roll or Brioche: Traditional Caesar with Roasted Chicken, Chef’s Salad (Romaine, Turkey, Roast Beef, Ham, Swiss, Hard Boiled Egg, Tomato and Ranch Dressing), Organic Spinach (Pesto Roasted Chicken, Red Onion, Dried Cranberries, Blue Cheese and Cranberry-Citrus Dressing), Classic Chop (Romaine, Genoa Salami, Roasted Chicken, Chickpeas, Scallions, Mozzarella, Provolone, Parmesan and Italian Dressing), Cup of Soup and Half Salad. Cold Drinks - Fountain Drinks (16 oz), Soft Drinks (12 oz can), Bottled Water, San Pellegrino (12 oz can), Selection of Juices, Milk. Retail Items - A selection of our house-made baked goods to go: Breads by the Loaf: Brioche, Honey Wheat, Marble Rye. Six-Pack Assortment of Muffins and Pastries. House Made-Granola.